The proliferation of the “Marijuana Dispensary” in this age of the legalization of Marijuana has certainly attracted the attention of many owners/lessors of commercial property. If a commercial property owner or property management company wants to take advantage of the lucrative rents being paid by the owner of a Marijuana Dispensary the Commercial Lease must have provisions that keep up with the current Federal, State and Local Laws which are undergoing rapid change. Each City and County that allows for the existence of a Marijuana Dispensary has passed laws and ordinances that govern where the Dispensary can be located and the licensing requirement for this type of business. Additionally, the State of California has promulgated legislation that requires a Permit/License for each type of marijuana business from growing, to distribution and sales. The emergence of this new age following the legalization of the sale and distribution of Marijuana means new exposure for the commercial property owner in California. How does the Commercial Property owner/lessor/property management company prepare for the future in this new age? 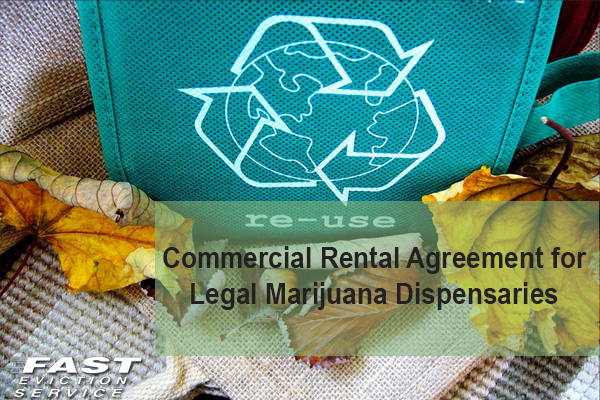 First, the Commercial Property owner/lessor/property management company should not be tempted to rent to the owners of the Marijuana Dispensary just because of the large rents and large security deposits such a relationship may bring. The property owner/lessor/property management company must due their due diligence by thoroughly vetting the business and business owners of the Marijuana Dispensary. Second, the application process for such a tenant must include receipt of the current business license/permits, insurance and corporate information such as current articles of incorporation or other legal documents from the Secretary of State of the California. These documents can be found on line at the Secretary of State Web Site business portal. Before renting to any type of commercial entity that business must prove to the landlord that it can do business in the State of California. Third, make sure that the Commercial Lease is up to date and contains a very specific “USE” provisions. If the rental property is going to be used as a Marijuana Dispensary that use must be specifically described in the “USE” provision of the lease. Additionally, there must be a provision in the Lease that describes one of the reasons for eviction to be that the USE of the rental property shall not violate any current Federal, State and/or Local Ordinance or any future Federal, State or Local Ordinance. Fifth, make sure that the commercial property has been inspected and can be used for the purpose intended. What that means check with the local fire and police agencies to determine that commercial property can be used as Marijuana Dispensary. Finally, the commercial property owner/lessor/property management company must be aware that any benefits that may come from renting to a Marijuana Dispensary will bring potential risks of criminal activity in and around the rental unit that must be planned for. Civil liability to the tenant and others that may occur on or around the property due to the presence of the Dispensary creates a significant financial exposure to the owner/lessor/property management company. Causation: was the landlord’s/property management company’s breach of that specific duty of care a substantial factor is causing injury to the tenant or ques. The Plaintiff must establish a non-speculative, substantial link or nexus between the omission and the injury. Damages: was the injury suffered a foreseeable risk from the negligence of the landlord’s or property management company’s negligence and are they reasonable. The financial benefits for the Commercial Property Owner/Lessor/Property Management Company may be significant but there are also major financial risks that come from such a relationship. The normal eviction rules apply to evicting a Marijuana Dispensary. These include (1) non-payment of rent; (2) illegal use of the rental property; (3) failure to have a proper business license/permit; (4) using the commercial property to create a nuisance; and (5) lack of insurance are just a few of the reasons to evict such a tenant. Whenever a situation exists as is happening with the rapid legalization of Marijuana across the country, the rapidly changing legal landscape can be the hardest part of the potential business opportunity to call. This is an environment where the politics can easily determine the final outcome of the tenancy so it is very important to take precautions to protect yourself in any eventuality.